With the action of the 16th edition of the Safaricom Sevens still fresh, the memory of Gabriel Lee the outstanding female referee who officiated at this year’s tournament’s matches stands out as an encouragement to many women aspiring to get closer to the strong game other than cheering from the terraces. Lee who -Hong Kong origin- was on her 1st trip to Kenya and Her authority in the field amidst the huge men was highly notable and commendable. Lee’s love for Rugby started back in 1995 during her high school in Hong Kong when she joined the school team. Within 2 years, her skills were professional that she was called up to the women’s national team (both 7 and 15 aside) where she featured in 1999 to 2007 when she retired from active rugby. 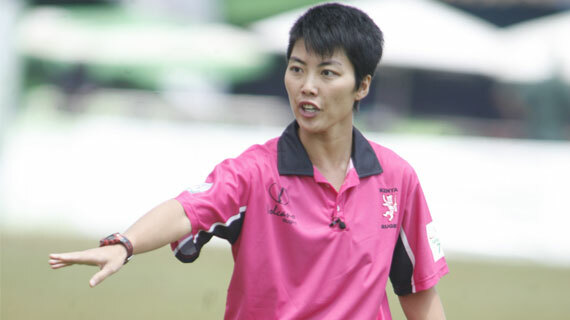 According to Lee, her biggest achievement so far was when she was called up to officiate matches in the 2009 IRB rugby world series in Dubai as well as the women’s world cup in 2010. This took place soon after she attended the IRB elite women panel (rugby course) in 2009. The 2011 Safaricom sevens series offered Lee a chance to visit Kenya for the 1st time ever, a trip which according to her was a total success. “The game here is highly professional. The tournament is full of talent from across the globe and the spirit of competition can easily be felt. Every team would stop at nothing other than victory but in the end, only the winner prevails,” she said. Despite the fact that rugby is highly ranked as a male dominated game, Lee assures other aspiring female referees of gender sensitivity. She explains of receiving fair treatment with her male counterparts back home and in other tournaments elsewhere as well. “I can not complain of gender insensitivity. So far, I have received fair chances just like the men and this acts as a build up mentally and emotionally. I encourage more women to take up the challenge and be part of the game rather than on the sidelines.” she added. Lee was also accompanied by another female referee Sarah Otieno and together they experienced the success of the 16th edition of the sevens tournament. However, she has challenged the Kenya Rugby Union to renovate the pitch to suit a recommendable rugby field in the future. The large spectator turn out was also noticeable and Lee congratulated the Kenyans for showcasing their full support to their team despite them bowing out of the competition in the semi final stage.